Authors: Kit O.I., Shatova Y.S., Tokmakov V.V., Novikova I.A., Ul’yanova E.P., Zlatnik E.Y. Aim. To evaluate the expression level and prognostic significance of androgen in primary operable luminal breast cancer without overexpression of Her2/neu in postmenopausal women. Methods. We analyzed treatment outcomes of 60 cases of primary operable (T1-2N0M0) luminal breast cancer without overexpression of Her2/neu in postmenopausal women. The follow-up period was 5 years. All cases were divided by immunohistochemical method into luminal A (20 females) and luminal B (40 patients) subtypes. Along with the standard panel of immunohistochemical markers, expression of nuclear androgen receptors was measured in tumor tissues of all patients. Depending on the expression levels, patients with luminal A and B subtypes were divided into three groups: (1) with high, (2) moderate and (3) low or negative expression. Results. Mean levels of androgen receptor expression in the nuclei of tumor cells in patients with luminal A subtype (57.3±5.9%) were higher than those of luminal B subtype (21.4±4.04%) by 62.7% (Mann-Whitney test, р=0.0026). In patients with luminal A subtype, the maximal accumulation of androgen receptors in the nuclei of tumor cells was 2.7 times higher (р=0.0023) than in patients with luminal B subtype. All cases diagnosed with the disease progression were characterized by low or negative level of nuclear androgen receptor expression. Conclusion. Negative and low levels of androgen receptor expression in tumor tissues of postmenopausal patients with luminal primary operable breast cancer without overexpression of Her2/neu might be an independent factor associated with poor prognosis. breast cancer, androgen receptors, luminal subtypes, prognostic factors. Turner N.C., Neven P., Loibl S., Andre F. Advances in the treatment of advanced oestrogen-receptor-positive breast cancer. Lancet. 2017; 389 (10087): 2403-2414. doi: 10.1016/S0140-6736(16)32419-9. Lim E., Winer E.P. Adjuvant chemotherapy in luminal breast cancers. Breast. 2011; suppl. 3: 128-131. doi: 10.1016/S0960-9776(11)70309-5. Sestak I., Dowsett M., Zabaglo L. et al. Factors predicting late recurrence for estrogen receptor-positive breast cancer. J. Natl. Cancer Inst. 2013; 105 (19): 1504-1511. doi: 10.1093/jnci/djt244. Nguyen M.T., Stessin A., Nagar H. et al. Impact of oncotype DX recurrence score in the management of breast cancer cases. Clin. Breast Cancer. 2014; 14 (3): 182-190. doi: 10.1016/j.clbc.2013.12.002. Blok E.J., Bastiaannet E., van den Hout W.B. et al. Systematic review of the clinical and economic value of gene expression profiles for invasive early breast cancer available in Europe. Cancer Treat. Rev. 2018; 62: 74-90. doi: 10.1016/j.ctrv.2017.10.012. Goldhirsch A., Wood W.C., Coates A.S. et al. Strategies for subtypes - dealing with the diversity of breast cancer: highlights of the St. Gallen International Expert Consensus on the Primary Therapy of Early Breast Cancer 2011. Ann. Oncol. 2011; 22 (8); 1736-1747. doi: 10.1093/annonc/mdr304. Nadia Harbeck, Michael Gnant. Breast cancer. Lancet. 2017; 389 (10074): 1134-1150. doi: 10.1016/S0140-6736(16)31891-8. Prat A., Cheang M.C., Martin M. et al. Prognostic significance of progesterone receptor positive tumor cells within immunohistochemically defined luminal A breast cancer. J. Clin. Oncol. 2013; 31 (2): 203-209. doi: 10.1200/JCO.2012.43.4134. Ono M., Tsuda H., Yoshida M. et al. Prognostic significance of progesterone receptor expression in estrogen-receptor positive, HER2-negative, node-negative invasive breast cancer with a low Ki-67 labeling index. Clin. Breast Cancer. 2017; 17 (1): 41-47. DOI: 10.1016/ j.clbc.2016.06.012. Палтуев Р.М., Кудабергенова А.Г., Семиглазов В.Ф., Комяхов А.В. Автоматизированный анализ клеточной плотности при раке молочной железы как дополнительный способ повысить объективность и достоверность прогноза рака молочной железы. Опухоли женской репродуктивной системы. 2017; 13 (3): 12-16. doi: 10.17650/1994-4098-2017-13-3-12-16. Шатова Ю.С., Франциянц Е.М., Новикова И.А. и др. Антиандрогенная терапия: новое направление таргетной терапии рака молочной железы? Соврем. пробл. науки и образования. 2017; (3). https://www.science-education.ru/ru/article/view?id=26392 (дата обращения: 29.10.2018). Ogawa Y., Hai E., Matsumoto K. et al. Androgen receptor expression in breast cancer: relationship with clinicopathological factors and biomarkers. Int. J. Clin. Oncol. 2008; 13 (5): 431-435. doi: 10.1007/s10147-008-0770-6. Basile D., Cinausero M., Iacono D. et al. Androgen receptor in estrogen receptor positive breast cancer: Beyond expression. Cancer Treat. Rev. 2017; 61: 15-22. doi: 10.1016/j.ctrv.2017.09.006. Рябчиков Д.А., Воротников И.К., Козлов Н.А., Чхиквадзе Н.В. Андрогеновые рецепторы как фактор прогноза в различных молекулярно-биологических подтипах рака молочной железы. Сибирский онкол. ж. 2017; 16 (3): 40-45. doi: 10.21294/1814-4861-2017-16-3-40-45. Hu R., Dawood S., Holmes M.D. et al. Androgen receptor expression and breast cancer survival in postmenopausal women. Clin. Cancer Res. 2011; 17 (7); 1867-1874. doi: 10.1158/1078-0432.CCR-10-2021. 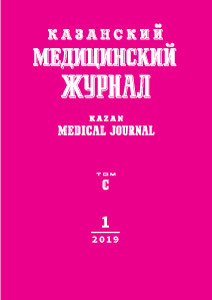 © 2019 Kit O.I., Shatova Y.S., Tokmakov V.V., Novikova I.A., Ul’yanova E.P., Zlatnik E.Y.